윤진아, 손용석,(2009).손바닥선인장의 열매와 줄기가 Streptozotocin으로 유발된 당뇨 쥐의 혈당 및 지질대사에 미치는 영향.한국식품영양과학회지,38(2),146-153. 손바닥선인장의 항당뇨 효과와 기작을 알아보기 위한 연구의 일환으로, 손바닥선인장의 열매 및 줄기의 급여가 STZ으로 당뇨가 유발된 8주령 수컷 흰쥐의 음수량, 식이섭취량, 체중, 공복혈당, 당내성에 미치는 효과와 당뇨의 합병증인 고지혈증(중성지방, 유리지방산, 총콜레스테롤, LDL-콜레스테롤, HDL-콜레스테롤)을 조사하였다. 손바닥선인장의 열매 및 줄기는 동결건조 후 분쇄하여 분말사료에 8%(열매) 및 5%와 10%(줄기) 수준으로 첨가하여 3주간 자유채식 시켰다. 실험군은 정상군(NC), 당뇨대조군(DC), 열매급여군(DOF), 줄기5%급여군(DO-5), 줄기10%급여군(DO-10)으로 구분하였으며, 음수량은 1일, 식이섭취량은 2일 간격, 체중 및 혈당은 1주 간격으로 측정하였는데, 혈당은 12시간 절식 후 꼬리정맥에서 측정하였다. 당 내성은 공복 시 혈당을 측정한 후 포도당(50 ㎎/체중 1 ㎏)을 복강에 주사한 다음, 30, 60, 90, 120분 경과하였을 때 혈당과 동일한 방법으로 측정하였다. 수분함량은 열매가 94.5%, 줄기가 92.3%였고, 조회분, 조단백, 조지방, 조섬유 등의 농도는 줄기가 열매에 비해 높았고, NFE는 열매가 줄기에 비해 높았다. 체중변화는 DC에 비해 DOF에서 체중이 적게 감소했다. 음수량과 사료섭취량은 NC에 비해 DC가 각각 7.5배 및 1.5배 이상 증가하였고, 처리군들은 음수량 및 식이섭취량이 DC에 비해 낮았다. NC의 공복혈당은 평균 100 ㎎/dL이었고 DC는 379 ㎎/dL이었으며, DOF는 DC에 비해 28%의 혈당 감소를 보인 반면(P＜0.05), DO-5는 5%와 DO-10은 9% 감소하여 유의적 차이를 보이지 않았다. 당 내성 실험에서 NC와 DO-5는 급여한지 30분 후에, 다른 처리군은 60분 후에 최고 혈당을 나타내었다. 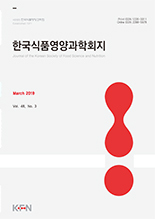 혈장 인슐린 함량도 당뇨대조군과 비교해 DOF, DO-5와 DO-10에서 유의적(p＜0.05)인 증가를 보였다. 이로써 손바닥선인장의 열매가 STZ으로 당뇨가 유발된 쥐에서 당뇨의 개선효과가 있는 것으로 판단된다. 또한 손바닥선인장의 열매 및 줄기 모두 당뇨의 합병증인 지질대사에서 혈장의 중성지방, 유리지방산, 총 콜레스테롤 그리고 LDL-콜레스테롤을 모두 DC와 비교해 DOF, DO-5와 DO-10에서 유의적인 감소를 보였다(p＜0.05). 이상의 결과에서 볼 때, 손바닥선인장의 열매는 항당뇨효능이 있었고, 또 당뇨 합병증인 지질대사의 이상도 개선하는 것으로 관찰되었으며, 그 줄기는 통계적으로 유의한 혈당감소 효과를 보이지는 않았지만 당뇨의 합병증인 고지혈증을 개선시키는 것으로 나타나, 보다 구체적인 작용기작을 추가적 연구를 통해 확인할 필요가 있다고 사료된다. This study was conducted to examine the effects of fruits and stems of Opuntia ficus-indica var. saboten Makino on water intake, feed intake, body weight, blood glucose level and glucose tolerance in streptozotocin (STZ)-induced diabetic rats. Forty Sprague-Dawley male rats were divided into non-diabetic control (NC), diabetic control (DC), 8% Opuntia fruit (DOF), 5% Opuntia stem (DO-5) and 10% Opuntia stem (DO-10) groups. Fruits and stems of Opuntia ficus-indica were freeze-dried and ground before use in the experiment. Animals were fed experimental diet for 3 weeks. DOF, DO-5 and DO-10 groups showed lower water and feed intake as well as less body weight loss than DC group. The fasting blood glucose levels were 100 ㎎/dL for NC and 379 ㎎/dL for DC. Fasting glucose level of DOF was a significantly low level of 28% (p＜0.05), whereas DO-5 and DO-10 had a decrease of 5% and 9% compared to DC. As for the glucose tolerance test, the highest blood glucose levels for NC and DC-10 group were observed at 30 minutes after glucose injection while those of DOF and DO-5 groups were after 60 minutes. DOF and DO-5 plasma insulin level improved. Plasma total cholesterol, triglyceride, non-esterified fatty acid (NEFA) and LDL-cholesterol concentrations were also lower in DOF, DO-5 and DO-10 groups, although HDL-cholesterol level was only slightly affected by experimental diets compared to DC. These results suggest that the feeding of Opuntia ficus-indica fruits and stems improved blood glucose and lipid metabolism in STZ-induced diabetic rats.